Post conference day I awoke feeling relief and satisfaction in equal measure. The sun was out and I was determined to make it my mission to see some animals before my red-eye flight home. In the house I was staying at were three other conservationists also making good use of the UN rep and his wife’s hospitality. One of them was a British guy who has been in Kenya for a couple of years and Africa in general for many more. He has a comedy surname which sounds like a Class A drug and for that reason alone I have called him Uncle Charlie. Both Uncle Charlie and I headed into the compound in the morning. For me it was a chance to say goodbye to the wonderful staff I had met and also to squeeze in any last-minute networking. For Uncle Charlie it was to listen to the morning’s sessions. At 2pm I persuaded Uncle Charlie to come with me to Nairobi National Park. We were picked up by Charles our driver who drove us through the city passing the Westgate Shopping Mall – where the latest terrorist attack happened. I made him stop the car. Without wanting to get out I did what any journalist would do, I lowered the window and took a photo. For the normal folk among you, you’re probably disgusted, but it was a completely natural reaction for a reporter. The area is still boarded up. On the left hand-side by the window on the top floor you can still see a cluster of bullet holes. The whole community here has been shocked. I met lots of people who lost friends and loved ones in the attack. It’s very sad and there’s a lot of frustration as the government were so slow to react. It felt odd being there so soon after. 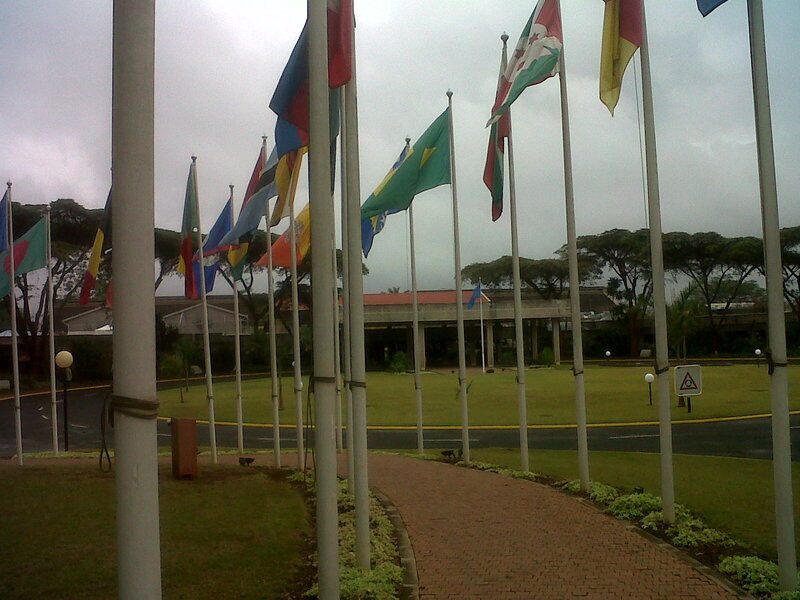 The rest of our drive was spent talking about Africa and the cultural differences while stuck in slow-moving traffic. Uncle Charlie has nine lives I’ve decided, he has lived in a few different countries on the continent. Thankfully he was nowhere near the mall when the shooting took place. But when he was in Cameroon, he was staying in a house with the director of a charity and a female volunteer when they were broken into. It was evening and the men who came were armed, aggressive and many. Uncle Charlie together with the two other people were lined up facing a wall and each had the cold barrel of a gun placed at the back of their necks. They wanted money. It was as simple as that. But like all good scousers in hindsight he was able to joke about the situation having not lost any limbs or suffered damage to any internal organs. The three of them were extremely lucky. He told me he only had four quid on him. Typical Liverpudlian! So it wasn’t much of a robbery. In the end the robbers took what little cash they had, the stereo and four CDs. Just wait till you hear which CDs they nabbed ………………….ABBA, yes I know ABBA!! The Blues Brothers, The Jam and Lauren Hill. I get Lauren Hill, it fits the bill of the gangster. But ABBA, seriously?? You’d have thought they’d have left it behind. Can you imagine them singing ‘Waterloo’?! Would they even understand the lyrics? By the time we pulled up to the entrance to the park it had already gone 3pm. I was desperate to see some animals. Disappointingly there were some painfully thin Africans dressed as Masai loitering in the car park outside the gift shop – I fear they were not genuine. They look so bored.No doubt waiting for a hapless tourist with dollars to spare. As our car drove through the gate our first sighting was a troop of lazy baboons sprawled out across the road grooming each other. A few of the adults bared their canines while the youngsters clambered over each other playfully. 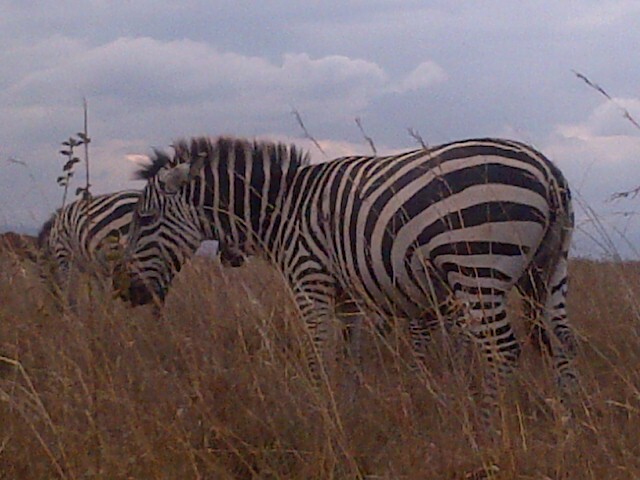 We bumped along carefully avoiding them and then took the right hand bend in the fork and began our safari. After scouring the tall grass for a good hour or so we were finally blessed with sightings of ostrich; zebra; wildebeest; buffalo; giraffe and one hell of a rhino. 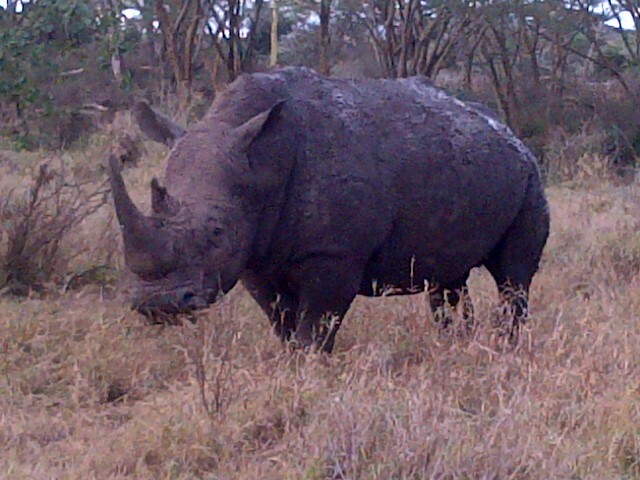 I’ve never seen a rhino before so I was thrilled to see one alive and with his horn still intact. Hurrah success! Sadly no lions. I’ve yet to see a pride. Uncle Charlie and I then grabbed dinner at a posh hotel over looking the park while quaffing vodka/gin and tonics watching the sun disappear before he dropped me off at the airport for my midnight flight. Suitably squiffy I boarded the plane and conked out for the entire duration of the flight until Dubai, where I was met by chaos and bling in transit. God love the Middle East! 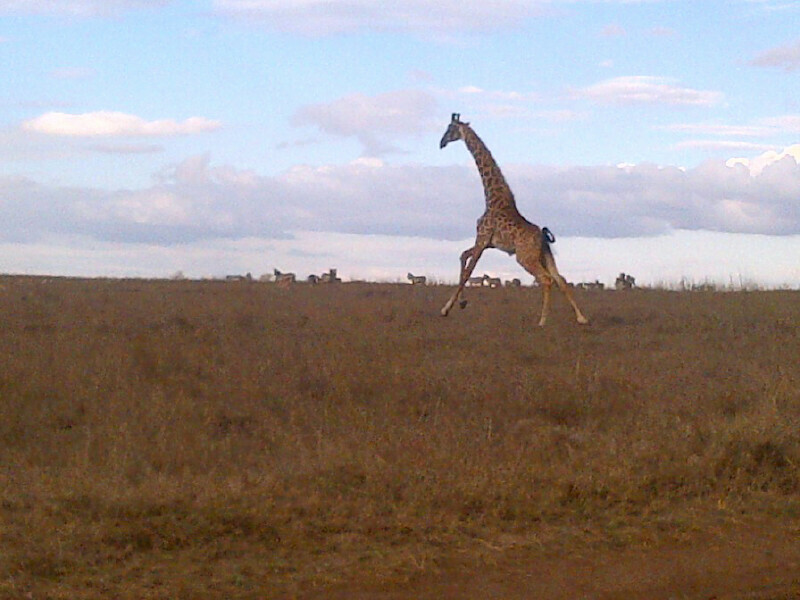 Here are some of the best pictures from safari – albeit on a Blackberry phone.